Liz Horgan, director of Career Services here at Nichols College, describes herself in five words: caring, open-minded, self-motivated, sarcastic, and impatient. If you know Liz, right now you’re smiling because those words so embody who she is. If you have not yet met Liz Horgan, there’s no time like the present. She’s more than just five words though — Liz is a person who knows how to succeed, and knows not to take success lightly. As we sat down to lunch recently, Liz let me know that her favorite time of day is not a particular time, but those moments when students come in to share their success stories. Not just because they have had a great moment in life, but because they took the time to share it. 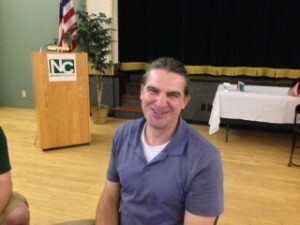 Liz taught my 3rd-year PDS (professional development seminar) at Nichols. As an adult student and a recent transfer, I am not even going to pretend I was an easy student. I initially refused to create a LinkedIn account, complained constantly about the portfolio I needed to produce, and was just a complete brat at the start. Clearly Liz saw something in me, because she listened to my nonsense, put me (gently) in my place, and formed one of those student-mentor relationships I am certain will continue beyond my graduation. Liz looks at each student for who they are, not what they offer. She saw that I was a good student and wanted to cultivate that. She took into account that I was having a hard time adjusting and took the time to guide me where I needed to be. You should see my resume — seriously. I thought I had nothing and maybe even felt like I was nothing but according to my resume, I am reasonably spectacular. But enough about me! 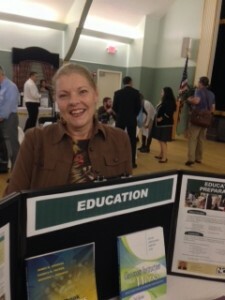 In addition to her duties with Career Services, Liz also is an educator at Nichols College, teaching as many as two PDS classes each semester. Just this year Liz is educating her first 3-credit course, a class offering students the chance to learn about self-assessment, resumes, cover letters, using social media to your advantage…basically, a course in how to excel and succeed in the workforce. There’s no question she is the clear choice to teach such a course. For 22 years, Liz worked in property management. Eighteen of those years were spent in college recruitment. Now leading the team in Career Services, Liz is able to see both sides of the equation in hiring with a point of view from both employee and employer. Career Services is located in the Fels Student Center and offers services for Nichols College day and evening students, as well as alumni. Even if you have graduated five years prior, you still have the option to come back to Nichols and seek help. Career Services has books for those wanting to read them, from guides on nailing an interview to workbooks about mastering the GRE. Career Services also offers web-based services to locate jobs such as Road to Success, which lists available jobs in the area; and CareerShift, an awesome new program that allows the job searcher to input criteria that will search potential employers as well as the employer websites. Why is this so awesome? Simple — at Career Services, the belief is that it is all about getting your resume in front of the right person. The technology behind CareerShift allows you to locate exactly who that person might be. Just how can you be sure your resume will impress? Try Optimal Resume, just one more service Career Services offers. Optimal Resume offers the user hints, tips, and tricks to get your resume near-perfect — definitely a must-use website for those writing a resume! There are so many things you can get from a visit to Career Services. If you want to bring in a list of companies you want to work for, Career Services will do their best to reach into their vast networking system and pluck someone they know, using social media and alumni to their advantage. They also offer one-on-one career coaching by appointment. 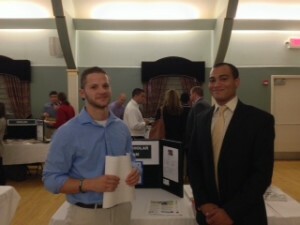 It’s important to know about the annual Career & Internship Fair here at Nichols. This year the event takes place on Tuesday, February 25, from 1:00 – 3:30. You can head over to the Athletic Center and speak to one of over 70 companies regarding employment and internships. Commonly called the ‘Career Fair’, this event was spear-headed by Cheryl Alderman and each year just becomes better and better. Liz does what she can to assist, but insists all credit go to Cheryl for the successes of this event. Don’t miss out on this event — mark your calendars now! If you have yet to do so, pay a visit to Career Services. There’s no time like the present. So many of us have heard, “What do you want to be when you grow up?” It is a question with an answer that constantly changes as we evolve. I myself have changed my occupational path from a veterinarian at age ten to simply being myself at age thirty (yes, thirty — I am what you may term an ‘adult learner’). It’s hard to know what you want to do — for the rest of your life — at any point in time, never mind while in your late teens and early twenties. Thankfully, Nichols College tries its absolute best to help students answer that timeless question of what to do with one’s life. 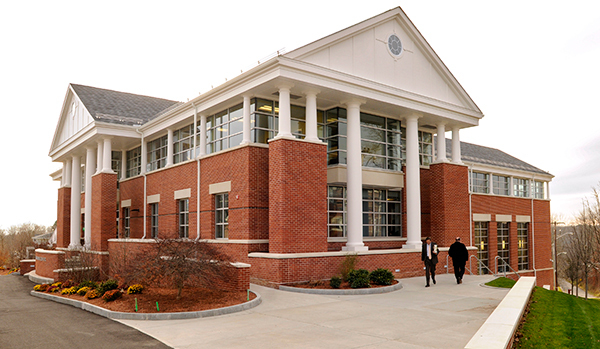 It is undeniable that Nichols College prepares its students for success. A quick tour of the campus shows plenty of comfortable places to study, to type up a paper, to prepare a coffee or hot tea…but more than that, Nichols gives students the hands on chance to explore that many need. From internships to cultural events and everything in between, Nichols rises admirably to the challenge of helping students decide which major/minor to pursue for their academic career. 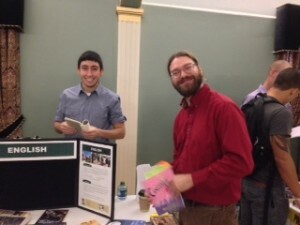 The Academic Fair at Daniels Auditorium brought out students in droves; at times the hall was so crowded all you could hear were the words “Excuse me!” as students visited with professors and students at each booth. 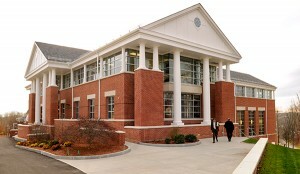 All majors Nichols College offers to the student body were represented as both a choice for major or minor, including graduate studies and the honors program. 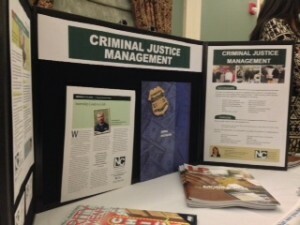 Each table was set with a tri-fold board displaying department details and tables offered examples of work or showcased the opportunities to be had in each field. Proud professors and exemplary students stood sentry to honor and glorify their department. First-year PDS students were required to attend, an excellent way to ensure students know what opportunities the college offers. As the freshman students toured the hall, they had a questionnaire that was required as homework for each PDS class. This was no simple survey; students needed to list with whom they spoke, what careers and advancement opportunities could be made in each field, and to spend time actually talking to more than one representative of any given major. Another major score for the PDS program here at Nichols, the professors do not allow students to simply walk in and out and be done with the assignment. They must explore — although not one student seemed forced. Questions asked were thoughtful, and follow-up questions by the students were reflective. It is not too late to explore major or minor options in your academic career! Be sure to visit http://www.nichols.edu/academics/academics/Faculty/ to determine who you should speak with about changing/declaring a major or adding a minor.